This is a 3 bedroom condominium with 2 bathrooms. Sleeps six people. The elegant surroundings at Tuscana Condominium Villa Resort will make you feel at home. Tuscana Club House is available for guests use during the day or evening. The clubhouse features a large state of the art 25 seat movie theater exclusively for your entertainment. The cinema is a cool and comfortable place for the whole family to gather with friends and watch a movie. You can also drop the kids off at the cinema and we will play a Disney movie while you go relax by the pool and have a refreshing beverage. This room can also be reserved for a small meeting or conference. Inside the club house is our large fully equipped fitness center. Work out on our state of the art fitness equipment while watching TV or listening to music. Everything you need to relax or rejuvenate. Need to check your e-mail or print a document? Our club house Business Center is open daily. High speed internet access and a printer are available complementary for our guests. Minnie's Fun Spot: Come stay in our beautifully decorated three bedroom condo. This condo is located on the top floor with a view over the main pool area. We offer free internet use, cable tv and a fully stocked kitchen. Our condo is located directly across from the clubhouse and pool. We have laundry in the condo. Televisions are featured in all bedrooms as well as a 42' flat screen in the main living area. This condo has been renovated to feature hardwood flooring and ceramic floors throughout. Plenty of seating on the over sized balcony that overlooks the main pool area and clubhouse. Brad and I have a young family and live in Canada. Brad is employed as a police officer and I work for the provincial government in the field of Youth Justice. Our children are 7 and 2 years old. They love to go to Florida and play in the pool and visit the parks when we can get a chance to go. Brad first visited Tuscana Resort without me. He raved to me about this fantastic spot he had found. Poolside cabanas! Flatscreen TVs in the poolside bar! Heated Spa and salt water pool! Granite countertops in the kitchen with gorgeous furnishings in the actual condo. The golf course spreads out from across the resort and was designed by Greg Norman. Just 4 miles from Disney!!! I visited soon after and was sold on this resort. We lucked out with the purchase of our condo as it has a fantastic view of the pool from our balcony. Looking for the best place in Orlando?? Look no further, this place is awesome. Clean, accommodating and close to everything. Condo was Very nice! Only drawback Music was so loud at bar nobody could sleep. Also didnt like 4th floor, as I dont do elevators! So climbing 4 floors twice a day for a 68 year old was AWEFUL! Nothing wrong with room. Everything was wonderful and peaceful! We had a great week!! Condo was convenient to Disney parks and a convention my daughters were attending. Contact with owner was always quick! We would go back if we were to travel to Orlando area again. Overall good stay. It’s in the first block near the pool good if you want to go swim bad if you want to sleep. Pool suppose to close at dusk kids and drunks still in there past 1030 so if you’re wanting sleep might not happen especially sat night as this is karaoke night. Condo is set up with a master bath and a separate bath so plenty of privacy has a fully functional kitchen which was great to keep cost down a Publix 5 mins drive away along with chili’s and bars. No paper towels, dish soap,laundry soap, garbage bags. This is stated in information somewhere but to have to go buy these essential items after driving or flying in to the location is an big inconvenience. 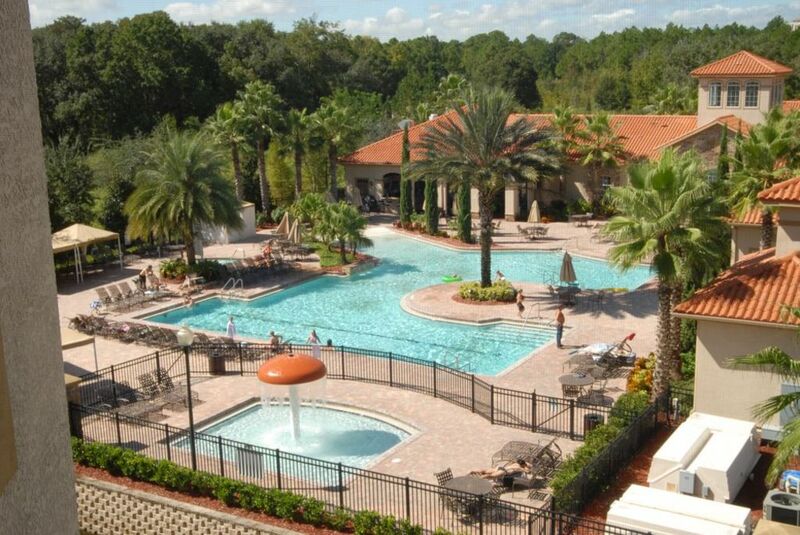 Tuscana Resort, is located in the heart of Orlando's premier Golf Community Champions Gate, Florida. Only two exits south of Disney World (approximately 4 miles) with easy 1-4 access to all Central Florida Attractions. Visit Clearwater or Daytona, east and west coast beaches, just 60 miles away. Golf: ChampionsGate Golf Club features 2 outstanding Greg Norman designed 18-hole courses as the centerpiece of a tourist/commercial destination, that encompasses 1500 acres of prime real estate just southwest of Disney World. A 35,000 square foot clubhouse includes complete dining and lounge areas , function/banquet space for 250 people, a fully stocked pro shop and guest locker rooms. The world headquarters of the David Leadbetter Golf Academy is also on property - with expansive complimentary practice facilities as a perk to visitors. This includes range balls plus the use of a huge putting green and a short game area with bunkers. Adjacent is a beautiful nine-hole par three course that is lit for night play! Cleaning Fee is only charged for stays of 5 days or less.